Electronic payment cards are becoming more prevalent and vital in a successful benefit plan offering. Introducing an electronic payment card into a reimbursement account plan empowers employees and gives them an option to inconvenient out-of-pocket expenses. With UPA, you have a choice of offering a debit card that integrates with a variety of benefit plans … HSAs, FSAs, HRAs, and Dependent Care! Our debit card platform was created in-house, so you are guaranteed a seamless single-source solution. The key is to have Card Services, Custodial Account Management, and Bank Services for the cards – as well as Electronic Fund Transfers — all under one roof and developed by the same company. No other program can offer you this level of integration. 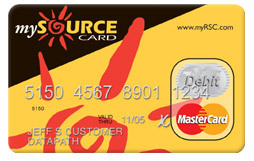 mySourceCardTMÂ is a MasterCardÂ© debit card that automatically reimburses an employer’s employees for eligible pre-tax expenses. Employees can use the card to pay for their health care and dependent care expenses at qualified locations that accept MasterCardÂ©, including doctor and dentist offices, pharmacies, and vision care locations. Approved expenses are automatically deducted from their pre-tax accounts — without the hassle of claim forms or reimbursement checks. The debit card is traditionally the platform of choice for FSAs because the card is tied to Merchant Category Codes (MCC), which restrict the locations that the card can be used and facilitate the auto-adjudication of eligible claims. Our experts can help you evaluate your situation to decide if a debit card is right you. Contact us today!